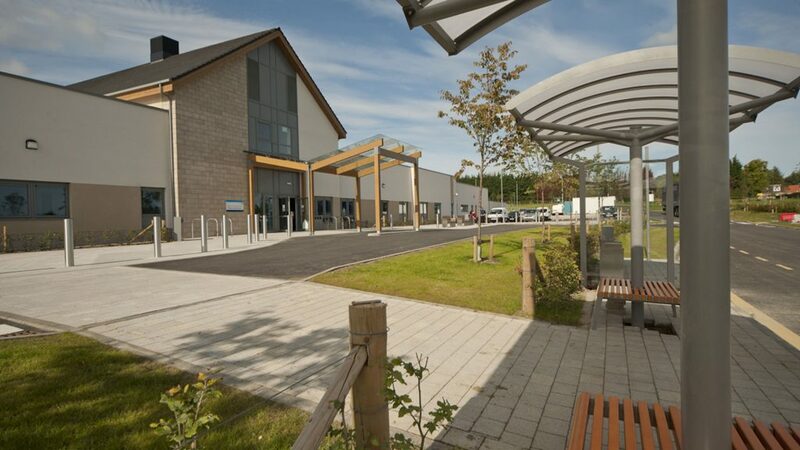 The principal objective of the Midlothian Community Hospital was to build a facility that would bring existing services from neighbouring Rosslynlee and Loanhead Hospitals, plus additional services, on to a single site whilst achieving ‘maximisation’ of flexibility in the use of accommodation. In response to this requirement, HLM Architects designed a bespoke 88 bed facility providing frail elderly continuing care beds and frail elderly mental health beds and day care facilities in a community hospital environment. Woolgar Hunter provided the Civil and Structural Engineering design, engaged by Robertson Construction on this Private Finance Initiative project for NHS Lothian. We worked closely with the architects to produce a fully coordinated building design, utilising a combination of steel and timber framed structures. The site had several challenging constraints including existing overhead electricity pylons and a buried high-pressure gas main. The ground conditions were also poor. However, we were able to develop a site design, which met the client’s expectations, whilst overcoming the engineering constraints and working within the budget. This included use of soil modification to stabilise the ground conditions and provide a stable building platform. We are delighted to note that during a post-project debrief NHS Lothian expressed a high level of satisfaction with the finished Hospital facility.